We believe Ethiopian coffees are entitled to have a special place in every coffee lover’s heart. It can be so pure and full of flavor nuances. They can be more like fruit juice or fruit tea than what we think of as coffee. And maybe that is just what coffees should be like? Ethiopia is a diverted and a complicated place to work in. We are constantly travelling there, and we have an origin office with ground staff, and a cupping lab located in Addis Ababa. We know what we are looking for and will be cupping through loads of coffees every year to choose the exceptional ones. We are buying both fully washed and natural coffees from Yirgacheffe, Guji, Sidamo and places in the west like Agaro, Limu and the greater Jimma area. The coffees can be from both Cooperatives and private washing stations as well as from medium to larger farms. Many of our Ethiopians are used in competitions and for signature coffees. Generally they are used from everything like different drip and pour over coffees to Espressos. They also hold up very well, and we have seen Ethiopian coffees at the peak more than a year after harvest. Ethiopia has a huge range of flavor profiles dependent on where the coffees are grown. We are trying to find a wide range, and select the best representatives for any region with great potential, and seek the ones with most uniqueness and complexity. Finding great coffees in Ethiopia requires a good insight in the complexity of the country, regions the trade and politics. The coffees can be extremely bright, crisp and at the same time full of flavors and sweetness. But even from the same exporters, regions and suppliers it’s also mediocre coffees that can be nutty, astringent, unbalanced, full of quakers etc. Our differentiation on Ethiopian coffees compared to others should lie in our ability of tasting and separating out and selecting coffees with certain and distinct flavor profile through extensive cupping. We do work strategically towards our suppliers, and have many returning Cooperatives and washing stations that we have supported over many years. The office and cupping lab also attracts a lot of “new” farmers and producers. There is a constant flow of “new” producers approaching us with their coffees. This way we get to see a very broad range of coffees from all over Ethiopia. We are also happy to analyze coffees and give feedback to producers that we are currently not working with. Our staff in Ethiopia are also there to chase and follow up the producer and the deliveries, samples of stock lots, milling, pre-shipment samples, shipment, financing. This is crucial to access the best qualities and to ensure efficient milling, logistics and quality control. 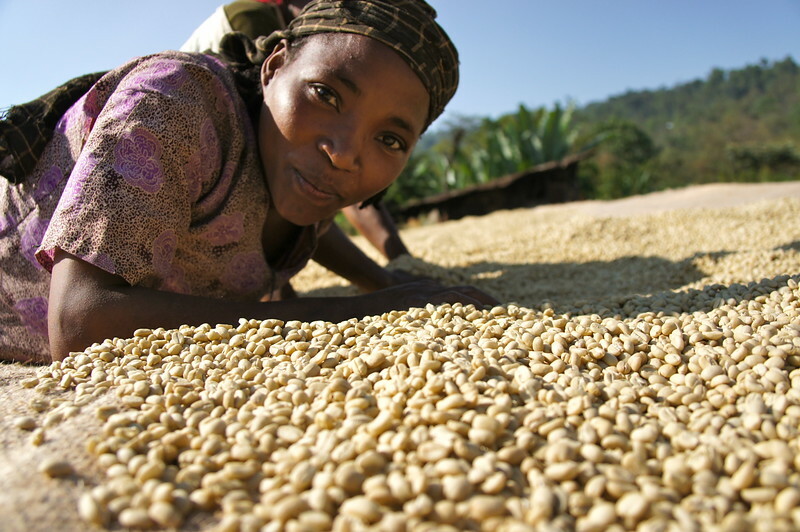 In Ethiopia the Estate coffees are traceable back to farm level. For Cooperatives or privately owned communal washing stations we seek traceability back to the producer (wetmill) as a minimum. We are only seeking coffees with distinct fruit driven characteristics. We pre-contract coffees and volumes, this helps producers and exporters on production, planning and finance. Price transparency to individual smallholder farmers will vary as many of the coffees are from communal washing stations, and one batch can be made up from hundreds of farmers. We strive to get as many details as we can related to geography, micro-climate, processing, cultivar, farm or block unless the coffee is a mix from multiple smallholders. We have a broad range of Cooperatives and private producers that we have worked with over the years. We have a constant dialogue with them on how to improve the quality and supply chain. We are also discovering new coffees every year, and are always open to new projects and products. To be as much on top of things as we can we have our country manager Marco Barra and product manager Semeon Abbay full time on the ground and a partnership that gives us the opportunity to manage a cupping lab with three members of staff in Addis. The coffee buyers Alex and Morten are frequently visiting throughout the season. Generally, this is from November through to March, at least once a month and spending a considerable amount of time understanding how the season in that given year is developing. This involves meeting with Cooperatives, growers and producers as well as our Exporting partners. We are traveling throughout the different regions during the harvest to check out the processing. Later as coffees become available we are cupping both samples from the beginning of the harvest and throughout 6 months from the harvest starts. This way we can early on identify areas and wet mills that are showing potential. We cup through initial rounds of samples and make preliminary selections of the coffees that have value to us. These coffees are then cupped in a multiple of further rounds. The coffees we decide to buy are cupped and assessed in a way that gives us good insight into the cup profile and quality, as well as the consistency of that particular lot. Nordic Approach is buying coffees from Cooperatives where we have established relations over time, private farms that sells directly to us, and private Washing stations that are offering their coffees to exporters through the ECX, or now also directly to us. They changed the system and regulations in 2017, so it is now “allowed” and completely in the open to buy directly from private washing stations. All the washing stations we work with are purchasing coffee cherries from the surrounding smallholders. A typical smallholder can have a few 100 trees in their garden from the local Ethiopian Heirloom varietal. Meaning one 100 bags lot of coffee can consist of cherries from hundreds of farmers. The daily coffee deliveries from the farmers will be mixed in the process for that day, and get a tag for the date and the grade. The coffees are either processed as traditionally fully washed coffees, eco pulped or as naturals. The cooperative coffees will be bought directly from the Cooperative Unions that is the umbrella organizations, and acts as the marketer and exporter of all Cooperative coffees in Ethiopia. The coffees from the private producers (washing stations that buys coffees from local smallholders) have the past years been bought through the ECX . (Ethiopian commodity exchange) that is an auction. These coffees are always selected purely based on it’s flavor profile and uniqueness by Nordic Approach at origin through extensive cupping. A new “window” opened up in 2017, that again allows private producers outside of the cooperative structures to sell directly to importers. Private producer Meaning the tracesability will be 100% and fully official. We are not yet sure how this will work for the coming years, and how it will affect the market. But we do know this is a great thing both for us as buyers, and for many of the producers and exporters. It’s mainly small gardens belonging to a family. On average farmers are having a farm size of less than 1 hectares. Most coffees are organic by default. Organic compost is common, pruning less common. A farmer can typically have less than 1500 trees per hectare, and 1 tree is typically producing cherries equal to less than 100 - 200 grams of green coffee. A mix of local varieties. Such as native coffee of forest origin transferred to family smallholder plots. The varieties are referred to collectively as Ethiopian Heirloom, which is a myriad of local native Typica hybrids and new improved varieties based on the old strains. The different areas do also have improved cultivars. They are developed by research institutes and often named by numbers. They also refer to them as e.g. Yirgacheffe type, Limu type, Sidamo type and so on. Smallholders that are growing coffee in regions throughout the whole country will pick the coffees themselves in their coffee gardens and deliver to the nearest site for cherry purchase. In some cases they do selective picking, or sorting of the cherries before they sell it to the washing stations. In many places the Cooperative and private buyers can compete side by side for the cherry purchase, and the farmers are free to deliver to any producer with the better prices. The washing stations will process all the cherry deliveries accordingly that same day. It will normally be processed as one daily lot. Most producers in Ethiopia is still doing the traditional pulping and wet fermentation. If they are quality focused the ripe cherries are hand sorted for unripes and overripes by the farmers or the workers before they go into production. They are typically pulped by a 3 disk Agarde (or similar) pulper that just removes the fruit and skin, and graded by density in water: The parchment with the mucilage is then fermented under water for 24-48 hours, depending on the temperature and weather conditions. After which again graded in the washing channels by water flow that separates the coffee by density. Its then soaked 12-24 hrs in fresh, clean water before it’s moved to the drying tables. In many of the new Cooperatives, and even some older washing stations they are now having mechanical removal of mucilage in eco-pulpers (also called aqua pulpers). The concept here is that the process saves a lot of water as you remove the mucilage mechanically. Theoretically you can also adjust the amount of mucilage removal and produce honey coffees. But this is yet not common in Ethiopia. I this case the cherries are potentially hand sorted for unripes and overripes by the farmers or workers before they go in to production. They generally use a Colombian machine called Penagos. This eco pulper removes the skin, pulp and mucilage through a centrifugal device. With this machine, they don’t need to ferment the coffee to remove the mucilage. Still it normally leaves about 10-20% mucilage on the parchment. Most producers using this technique in Ethiopia removes the rest by soaking it in clean water in concrete tanks for up to 12 hours. Drying coffees in higher altitudes in Ethiopia is pretty much ideal. Still they have to manage it well to get the better coffees out of it. In some places they do skin drying the first hours unders shade. In others they bring it directly out on the African drying beds in the sun. The parchments is normally dried in the sun for about 10-20 days, depending on the weather conditions. 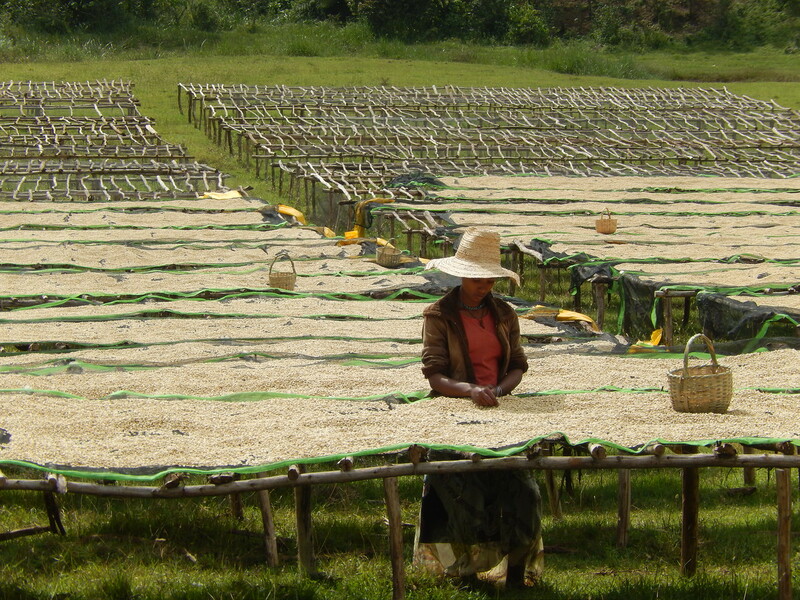 Coffees are covered in shade nets during midday and at night. Producing great natural coffees is challenging and it requires at least as much attention to details as producing good washed coffees. You have to carefully select the ripe cherries. The cherries are then hand sorted for unripe and over ripe cherries to get a sweeter and cleaner product. The Natural coffee is normally processed at the later part of the harvest and that’s when the harvest is peaking at the higher altitudes. The first phase of drying is crucial and should be in relatively thin layers on the tables to avoid fermented flavors. It should reach what’s called the “raisin” stage at about 25% moist in a few days. It’s important to move the cherries carefully to avoid damage on the fruit. In the second phase, from 25% - 12% moist, the layers are normally built up, and it’s constantly moved during daytime, and needs some rest mid-day and at night. An uncontrolled drying sequence can increase the very fruity flavors and make it unstable, and if to slow it can create mold and other off flavors. It’s a costly process that requires good labor and attention if you want it at the highest quality levels. The parchment will sit in in the warehouses at the washing stations more or less until the season is ending, and will then be trucked to Addis as separate stocklots for sales. The washing stations will normally gather up to 150 bags of parchment as one lot. (Approximately 100 bags of exportable greens ) Even the top producers generally prefers to manage it this way. That is partially the reason for a limited amount of micro lots coming out of Ethiopia. The coffees from the higher altitudes normally starts to come in to the warehouses from January and onwards. This is the time for cupping and purchase. 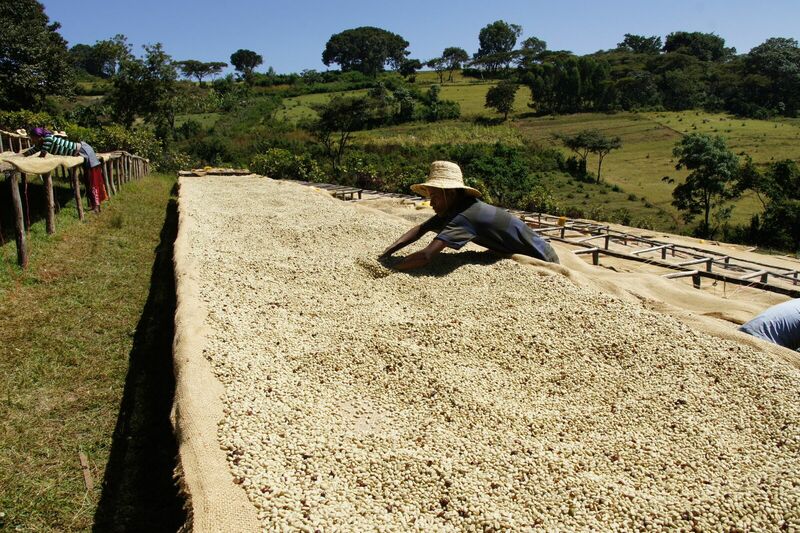 To accurately know the quality of the coffee you will have to wait for the parchment delivery to the dry mill. In most cases we will pre-book/contract the coffees and volumes in advance. But we will do the final and formal contracting when we have cupped the stock lot samples after they arrive in parchment to the dry mill. In general you will have to buy 100 bag lots at the time. Specially from the Unions. Our representatives will often be at the warehouse to collect the stock lot samples and make sure they are drawn from a representative number of bags. There are now a lot of new mills being built. Both by the Cooperatives and private producers and exporters. The seller of the coffee will normally dictate the mill. And it’s hard to e.g. get the Cooperatives to process their coffees with a private miller. The milling will be followed up locally by our representative in Ethiopia. He will be there during the milling of the coffees to ensure traceability and will do quality control for milling, grading and sorting. If it is not up to standard after checking, it will be reprocessed before shipment. The general grading and preparation in Ethiopia is screen 14 and up as the beans sizes are generally small. All coffees are shipped in grainpro. As a cooperative you are allowed to sell the coffees directly as a fully traceable product and can b ypass the ECX (Ethiopian Commodity Exchange). They are always marketed and sold through a Cooperative Union. Generally they will relate to the Cooperative Union representing the zone and area where they operate. Typically, a Cooperative in Limu is sold and exported by the Limu Union, In Oromia the Oromia Union, Sidama the Sidamo Union and so on. The family members of the smallholder farmers are picking small amounts of coffee that they will sell and deliver either at a collection site or directly to the washing station. They are free to deliver the coffee to the highest bidder no matter if it is a Cooperative or a private producer. The farmers will get paid in full based on the currant cherry prices in the area that day. In many cases the Cooperatives will pay them a dividend as a second payment when the coffee is sold at a premium. The Cooperative washing station will in some cases start a thorough cherry selection and sort and handpick cherries as well as flotation and screening etc if they aim at producing higher grades such as grade 1&2. They will process the coffee according to their production plans either as washed or naturals depending on their access to water and the time of the season. The Cooperative washing station will deliver the dried parchment to a local ECX warehouse that will grade the coffees accordingly. There are many different grades such as Grade 1 – Grade 5 depending on the physical qualities as well as the flavor profile. The coffee gets a ”label” based on the region and the quality before it’s offered directly to buyers through the Cooperative Unions. After grading the Cooperative Unions will in most cases move the coffee to their position in Addis Ababa or other warehouses they might use. The Cooperative Unions will offer us samples to cup after they have stock lots in their position. Generally they offer lots to cup in 100 bag chunks. And we can pick and choose coffees among different Cooperatives Washing stations from one Cooperative Union. Managing lot separation, great processing and transparency is key when we select our Cooperatives and producing partners. After cupping through hundreds of samples this coffee is from our selection of Grade 1 rated coffees from private producers selling the coffee through the ECX (the Ethiopian coffee exchange) also referred to as the Ethiopian coffee auction. The regulation of ECX as for today is limiting official traceability of the coffees from private washing stations. Only Cooperatives and single farmers (landowners) with producer/export licence are allowed to market sell and export their own coffee as a traceable product. But that does not mean the coffees from ECX is of lower quality and less flavorful. In many cases it can be the opposite. The coffees are sold through the ECX based on the grade and woreda (local municipality). That said, in most cases for the Grade 1 coffee we know where it is from based on the local knowledge of the woreda, grade and the producers offering coffees from that area. We also know a lot about the product, process, selection, what the smallholders are generally paid (based on the current coffee prices in certain areas during the season), and how much work the producers are putting in to the production to target the quality. The farmers will get paid in full that based on the currant cherry prices in the area that day. In many cases the private producers are consistently paying premiums above the market price for quality or to attract farmers when the competition is high. The washing station will in some cases start a thorough cherry selection and sort and handpick cherries as well as flotation and screening etc if they aim at producing higher grades such as grade 1. The wet mill will deliver the dried parchment to a local warehouse fo ECX that will grade the coffees accordingly. There are many different grades such as Grade 1 – Grade 5 depending on the physical qualities as well as the flavor profile. The coffee gets a ”label” based on the region and the quality before it’s offered through the ECX. The exporter will know what they are buying based on the grades, the region and the local Woreda (municipality) It can typically be a Yirgacheffe Kochere Grade 1. In many cases there are a limited amount of producers offering Grade 1’s from that area at the given time. And as the exporters might be well informed and well connected with the producers in that area they will know who is offering that grade 1 the given week. The coffee is sold to the exporter through the ECX, based on minimum prices that are changing with the forecasts, supply and demand and many other factors. When the given lot is purchased by an exporter it’s moved from the local warehouse to the exporters prefered warehouse. The exporters will offer us samples to cup after they have purchased the coffees. Generally they offer lots to cup in 100 bag chunks. And we can pick and choose coffees among different exporters and regions to find the specific profiles we are looking for. There are exporters focusing more on the Grade 1’s than others as well as some of them are specialized in targeting the highest qualities and the specialty market. Managing lot separation, great processing and transparency is key when we select our exporting partners.